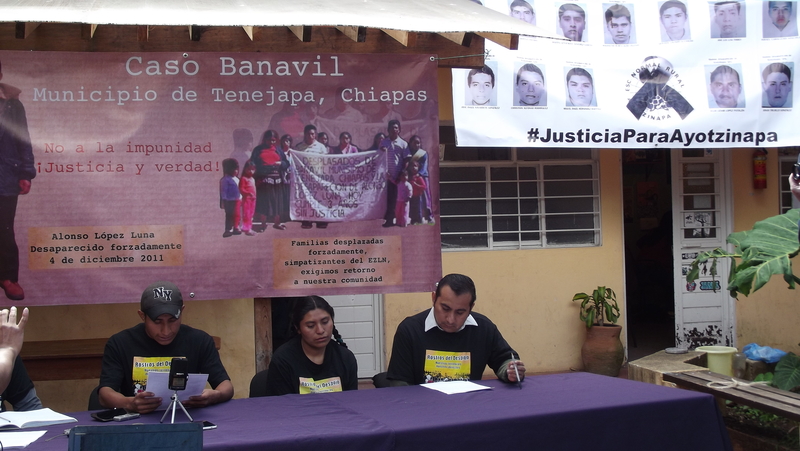 On 4 December 2014, 3 years were commemorated since the attacks in the Banavil community, Tenejapa municipality, Chiapas, as prosecuted by members of the Institutional Revolutionary Party (PRI). In a press-conference, the Zapatista-sympathizing families mentioned the attack with firearms which led to the displacement of 13 persons “who have lost everything and are prevented with death-threats from returning.” The attack caused the death of Pedro Méndez López, while six others were injured, and Alonso López Luna forcibly disappeared. Furthermore, two arbitrary arrests were carried out of Lorenzo López Girón, son of the disappeared who was injured by gunfire and then accused of assault and battery, as well as Francisco Santiz López, Zapatista support base (BAEZLN), who was actually located elsewhere during the attack. Subsequently, both were released, with Francisco’s case won thanks to the work of a special campaign involving international-solidarity actions. This entry was posted on Tuesday, December 16th, 2014 at 9:31 am and is filed under Chiapas, Disappeared, EZLN, Human Rights, Human Rights Defenders, Indigenous people, Justice system, Land and Territory, Land rights, Paramilitary, Women, Youth. You can follow any responses to this entry through the RSS 2.0 feed. You can leave a response, or trackback from your own site.